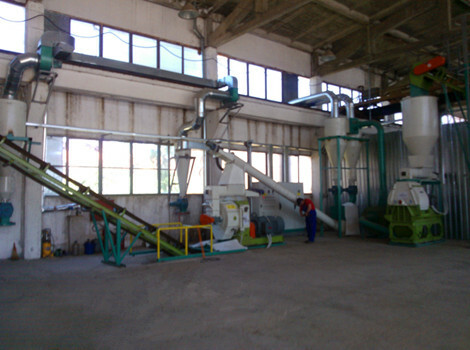 Palm waste biomass pellets production process includes chipping, crushing, drying, pelleting, cooling and packaging. 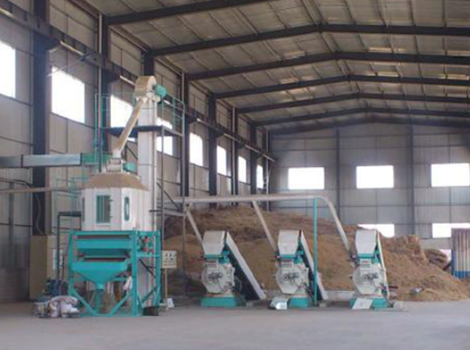 The machines in 1.5t/h palm waste biomass pellet plant are chipper, crusher, dryer, pelletizer, cooler and packer. Drum wood chipper is an ideal choice for processing large-scale biomass materials into small pieces for pelletizing. This wood chipper is mainly composed of base, knife roller, feed roller and belt conveyor. The hydraulic pressure system is also adopted for this machine. The base is made up of high-strength steel so as to support the whole body. Two blades are equipped for the knife roller for cutting materials. Due to the hydraulic pressure system, the feed roller can be adjusted according to the thickness of different raw materials. 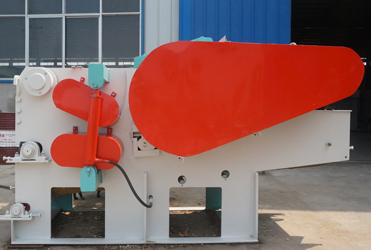 Water drop hammer mill gets the name due to the water-drop structure of its grinding chamber which can solve circulation problems during pulverizing process. 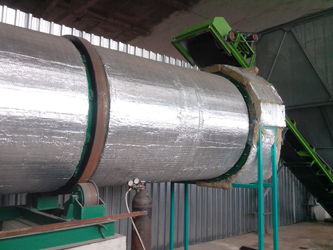 It is widely used to grind many kinds of biomass materials by large and medium sized pellet plants. 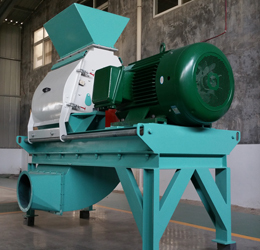 During this step, the materials firstly enter into the hammer mill via the upper inlet, then get impacted by the hammer with a high rotate speed, and gradually become small sized particles. The smaller sized particles are discharged through the screen by centrifugal force and air flow; while the bigger particles are still left within the sieve, and they will be sequentially blown and crushed by the hammer. There are mainly two types of dryer, namely rotary dryer and pipe dryer. In this line, the rotary dryer is adopted. With this dryer, the moisture of raw materials can be reduced , thus becoming suitable for producing briquettes and pellets. 1.With higher efficiency but low energy cost. MZLH508 pellet mill is composed of feed inlet, screw conveyor, speed regulating motor, pelletizing chamber, transmission box, main motor and base. The aerodynamic technology is adopted, reducing the temperature in pelletizing chamber to around 90°C. As a result, the lifetime of itself and its parts can be expanded. Besides, it is a pellet mill with gear-driven structure,showing higher performance compared to the belt-driven one. Cooler is used to reduce the temperature and moisture of the pellets, thus acquiring better hardness and strength. Also it can facilitate transport and storage. We provide cooling machine with the capacity ranging from 3 ton to 20 ton per hour. The model, SKLN2.5 is adopted in this line. By this cooler, the pellets can be cooled evenly and sufficiently due to the reasonable structure and counter-flow principle. The automatic biomass pellet packing machine is of advanced design. The PLC controlling technology and accurate measure instrument are equipped. Thus it is highly precise in weighing. This automatic wood weighing & packing machine plays an indispensable role in pellet plant.